Once, in a deep cave, a fire burned. The people of the tribe were not successful in their hunting, and many were starving. The worst effected were the elderly and children. In one corner, on a bed of straw, an old woman lay, coughing heavily. A young girl offered her a small root. “Grandma, eat this root,” said the girl. 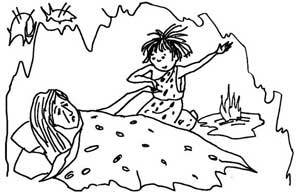 The girl rushed out of the cave. “Heaven above, please save my grandmother,” she pleaded. The girl prayed so fervently, that her request was heard by the fig fairy who lived in the celestial paradise garden. She came down to Earth to speak to the young girl. “Follow me,” ordered the fairy. The girl ran after the fairy, who led her into a nearby forest. 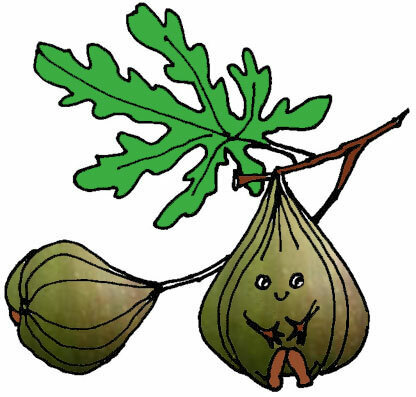 After locating a fig tree, the fairy quickly filled the girl's basket with figs. “From the beginning of time, I have been growing fig trees on Earth. Their sweet fruits contain every nutrient required for a healthy diet, as well as having medicinal properties, but people have only ever used their leaves. 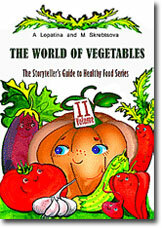 These fruits will save you and your grandmother,” explained the fairy. Then, as quickly as she had appeared, the fairy disappeared again. Barely able to contain her excitement, the girl rushed back to the cave. Carefully, she fed one of the figs to her grandmother. After swallowing the fruit, the old woman opened her eyes. “A fairy came down from heaven and gave them to me,” replied the girl. After hearing the story of how the girl had come across the figs, the rest of the tribe asked her to show them where they grew. The others were afraid of the fig tree, and decided to banish the old woman and her granddaughter from the cave, concluding that they were evil witches. The two unfortunate women built a shelter under the fig tree, and found that they had a plentiful source of food. The terrible cough, which had tortured the old woman for many months, disappeared without a trace. The fig fairy came to visit her tree, and was saddened to hear about what had happened. “The leader thinks that your fruits are bitter,” explained the girl to the fairy. 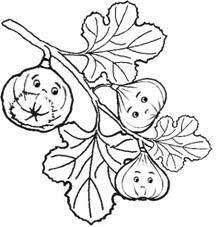 “Is it also true that poisonous little wasps live inside these figs?” continued the girl. In autumn, the fairy again came to see the girl, and to bid her farewell until the following spring.